Once in a while you'll come across a book that will tug at your heart, and will continue to do so long after you've put it down. 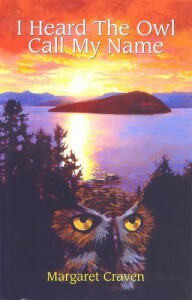 Margaret Craven's novel, I Heard the Owl Call My Name, is such a book. Mark Brian is a young Anglican vicar sent to an isolated Native village in British Columbia's Pacific Northwest. He finds a people struggling to keep their culture alive -- the young have alienated themselves from their cultural heritage and are adopting a more modern life in the white society. Broken totems poles and burial grounds where the moss-covered bones of their ancestors are left unattended is all that is left of a once noble nation. The young vicar has unknowingly been diagnosed with a fatal disease -- it is his journey through the land of the dying and the departed that he will earn the right to a funeral for a king. A truly wonderful, heart-wrenching story, which will have a permanent place on my shelf of books to read over and over again.